Johns Hopkins University's Laboratory for Computational Sensing and Robotics. I just noticed that I seem to have a little bit of association with each of these three overseas partners. Last week, on my way to the World Economic Forum at Davos, I called on the Mayor of Zurich, Ms Corine Mauch, to renew our friendship and explore new opportunities for collaboration between Zurich and Hong Kong, and technology was one of our agreed priorities. Today we are welcoming ETH Zurich to Hong Kong. Then I had first-hand knowledge of the work of Imperial College London's Hamlyn Centre, which I visited during my first official trip to London in September 2017 in my capacity as the Chief Executive, and since then we have maintained close contacts with Professor Yang. I also met with President Ron Daniels of Johns Hopkins University when he was in Hong Kong last year. I am therefore extremely pleased that my visits and meetings with renowned institutions all bear fruit within a short period of time. But I am certainly not suggesting that they are charmed by me to come to Hong Kong. Instead, I believe they find in Hong Kong the appeal of excellent research capability, strong fundamentals including the rule of law, IP protection, proximity to manufacturing powerhouses like Shenzhen and supportive government policies. Indeed, Hong Kong has long enabled connections between East and West, and long attracted people, companies and institutions, bringing them together to excel, whatever their aspirations are. In terms of supportive government policies, since becoming Chief Executive of the Hong Kong Special Administrative Region about 18 months ago, I have committed US$10 billion towards a broad spectrum of I&T initiatives. That includes specifically US$1.3 billion earmarked for the creation of two major research clusters in the Hong Kong Science Park. One is focused on healthcare technology, the other on robotics and artificial intelligence. 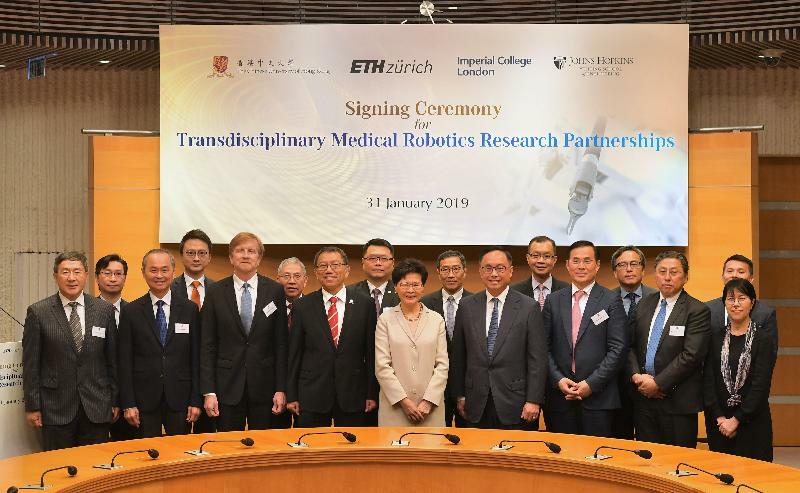 I'm pleased to know that the Multi-Scale Medical Robotics Centre has already applied for admission to the latter - AIR@InnoHK Cluster. My Government, let me add, has also introduced enhanced tax deductions up to 300 per cent for R&D expenditure incurred by private enterprises. In addition, we have launched programmes supporting R&D institutions that wish to add technology talent to their operations. In this connection, I know the new Centre is as committed as we are to talent development, with training to be provided to surgeons, engineers and others keen to gain expertise in robotics technology. Today's global alliance, made up of the three international institutions and the Chinese University, are all pioneers in medical robotics. 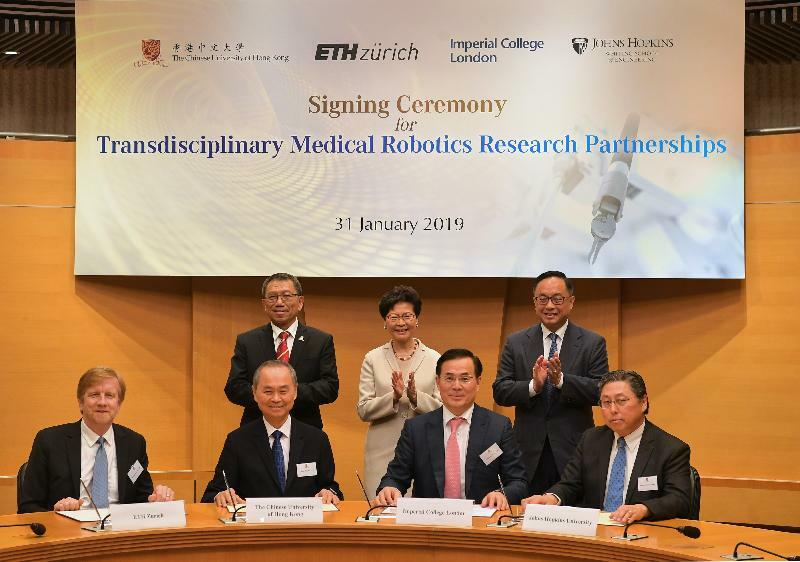 The Chinese University of Hong Kong is the first post-secondary institution in Asia to establish a robotic surgery training centre. To date, more than 1 300 robotic console surgeons from Asia have been trained here. Recently, the Chinese University completed the world's first multi-disciplinary clinical trial of the advanced, single-port robotic surgical system. With the coming together of these four prestigious universities, and their world-class robotics expertise, there is much to look forward to. I'm confident the Centre's research will advance the diagnosis and treatment of multiple medical specialties. 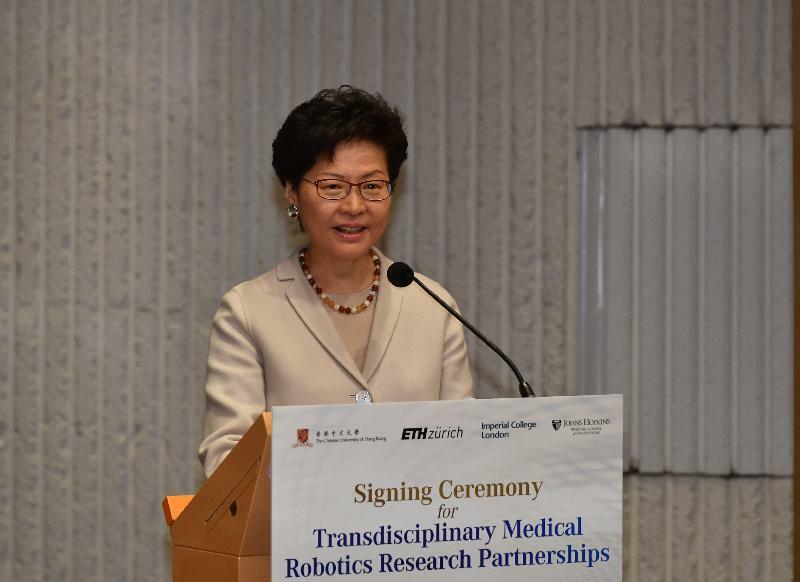 And I'm gratified to know that its research will be multidisciplinary, involving medical researchers, physicians, engineers and other specialists focused on developing robotics for innovative medical applications. I wish the four universities and everyone involved great success in this far-reaching collaboration. With Chinese New Year only a few days away, let me wish you, as well, a happy, healthy and prosperous New Year. Thank you very much.